Until recently, the largest animal that ever lived was believed to be the blue whale — which still exists today, but outsizes any known prehistoric species, including the largest dinosaurs and marine creatures. But the mighty mammal might have to give up its status as the world’s largest, in light of a new fossil discovery in England. In a study published in the journal PLOS ONE, paleontologists describe the remains of a huge ichthyosaur — an aquatic reptile which likely co-existed with dinosaurs during the Triassic and Cretaceous periods (between 205 and 210 million years ago), and this particular specimen may have measured 85 feet long. According to National Geographic, most ichthyosaur fossils found in the region were considerably smaller than this find, usually measuring between 5 and 13 feet. The first fossil fragments of this specimen were uncovered on a beach in Lilstock, Somerset by Paul de la Salle, who sent photos of his find to experts at the University of Manchester and SUNY Brockport. More fragments were found to belong to the same bone, and were identified as part of the largest ichthyosaur ever recorded. 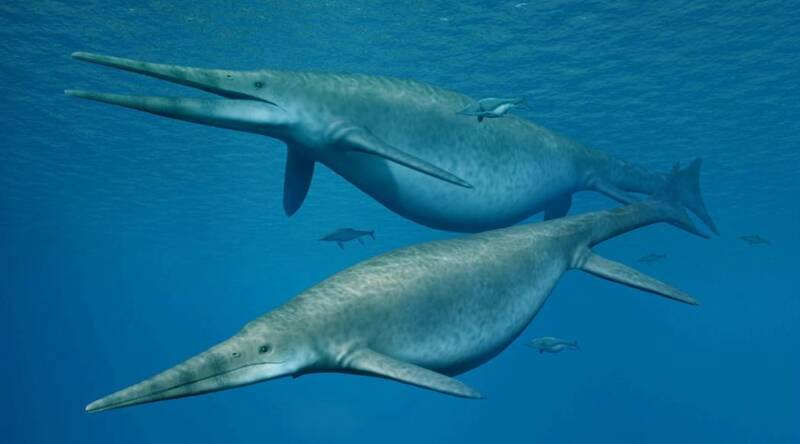 Their estimates are based on a comparison to a nearly complete fossil skeleton of ichthyosaur Shonisaurus sikanniensis unearthed in Alberta, Canada in 2004 — which measured 69 feet long — and the ichthyosaur bone found in the UK is 25 percent larger. This discovery has led paleontologists to re-evaluate a group of similar bones collected over the past two centuries in the village of Aust in Gloucestershire — which were previously thought to be remains of land-based dinosaurs, but may in fact be the bones of massive ichthyosaurs. Previous Story LES MINIKEUMS: The Creepiest "Kid-Friendly" Pop Group Ever?